Many modern gadgets are now switching to wireless charging.Laptop manufactures have also also welcomed this technology.Recently Dell unveiled First Wireless Charging Laptop (Dell's 2-in-1 Latitude 7285)in CES 2017.Latest apple and samsung devices are also equiped with wireless charging support.You ever wonder 'how does wireless charging works? '.Wireless charging (Inductive charging )uses an electromagnetic field to transfer energy between two objects through electromagnetic induction.Energy is transferred through an inductive coupling to an electrical device, which can then use that energy to charge batteries or run the device. You might have heard of the word 'resonance' .Resonance is a phenomenon that occurs in nature in many different forms. In general,resonance involves energy oscillating between two modes.In a system at resonance, it is possible to have a large build up of stored energy while having only a weak excitation to the system. The build-up occurs if the rate of energy injection into the system is greater than the rate of energy loss by the system. Resonant frequency is the frequency at which maximum energy is stored in the system,If two resonators are placed in proximity to one another such that there is coupling between them, it becomes possible for the resonators to exchange energy. The efficiency of the energy exchange depends on the characteristic parameters for each resonator .Maximum energy is transferred when frequency of two resonators are same.By varying L and C ,frequency can be varied. Let Ls be the inductance coil connected to the power source Vs, and Lr is the receiver coil.When a current is passed through Ls,it creates a magnetic field around Ls.This varying magnetic field causes current flow through Lr.Thus,energy gets transferred between coils via electromagnetic induction.At resonance this energy transfer will touch it's peak. Practical circuit for wireless charging applications are given below.The current induced in the receiver coil will flow through the battery connected across,and the energy gets stored in this battery. 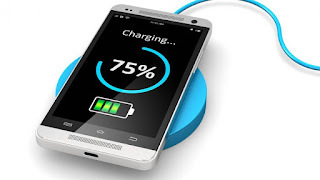 Wireless chargers for portable consumer electronics like mobile phones,laptops,tablets,smartwatches etc..
For charging implanted medical devices including heart assist pumps, pacemakers, and infusion pumps etc..
For charging full electric and hybrid vehicles. 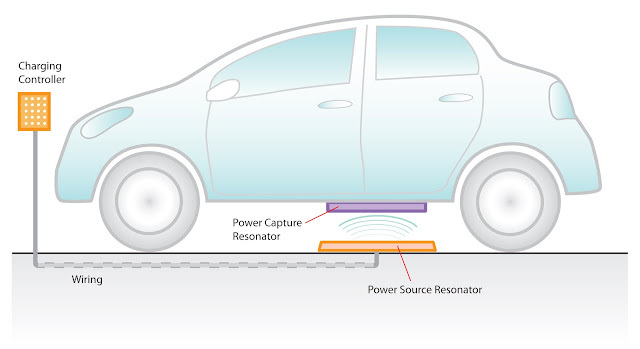 Qi (pronounced 'chee ' meaning "natural energy") is an open interface standard developed by the Wireless Power Consortium for inductive charging over distances of up to 4 cm (1.6 inches). The system uses a charging pad and a compatible device, which is placed on top of the pad, charging via resonant inductive coupling. Mobile device manufacturers that are working with the standard include Asus, HTC, Huawei, LG , Motorola ,Nokia, Samsung, BlackBerry, and Sony. For the list of devices given above you just need to buy a wireless charger. If your phone is in the above list, you need the accessory linked and a wireless charging pad. If your phone doesn't support wireless charging,need not worry,you just need a universal adapter and a wireless charger. You can get these for phones with Micro USB ports (e.g. Android) and Lightning ports (e.g. iPhone). There are two type of universal adapters available in the market.Internal adapter, which slides into the back of a case, and an external adapter, which hangs outside. 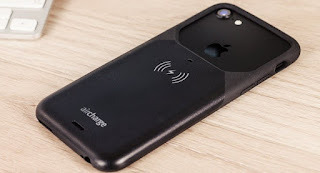 Maxfield is the leading producer of internal adpater and aircharge is the front runner in the external wireless charging adapters. 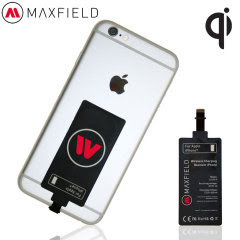 Without any hardware modification you can charge your iphone 6 in wireless mode by connecting maxfield adaptor. Wireless charging much more hassle free than wired one, but still requires the device be in physical contact with its station to actually work. That's about to change now that the Federal Communications Commission has approved the first wireless charger that works from up to three feet away.Wireless charging "at a distance" on its way to smartphones and other handheld devices. Make devices more convenient and thus more desirable to purchasers, by eliminating the need for a power cord. Make devices more reliable by eliminating the most failure prone component in most electronic systems—the cords and connectors. Make devices safer by eliminating the sparking hazard associated with conductive interconnections. Reduce system cost by leveraging the ability to power multiple devices from a single source resonator. Wireless charging and wireless power transfer technology is going to make a revolution in the consumer electronics as well as electrical appliances in coming days.A company named WiTricity specialized in wireless power solution is all ready out there in the market.More companies are coming into this field.We can expect some innovative products and technologies from such firms soon. Thanks for the post and great tips: even I also think that hard work is the most important aspect of getting success. How to wirelessly charge samsung galaxy S7?